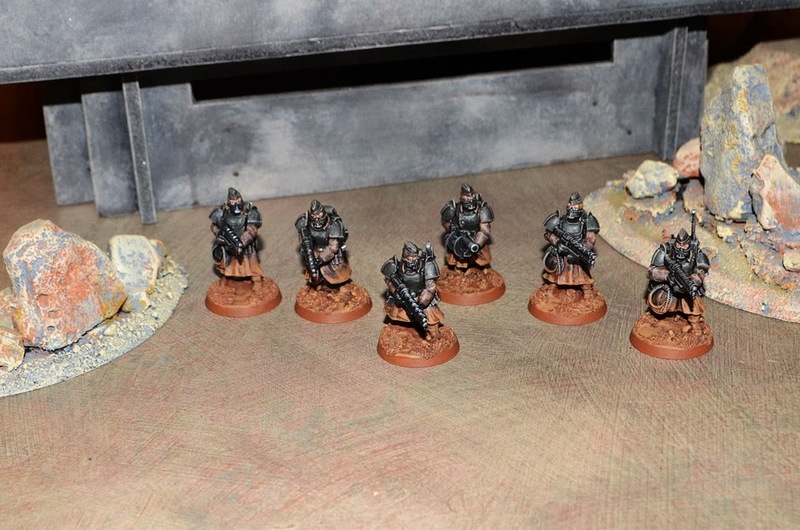 Nate Miller's Tabletop Games: Jägers Painted! Well I got the Jägers painted up today. This brings the total Wolfhound force up to 18 troopers 2 tanks and 1 APC. Not bad so far. I was kind of worried that the color for the bases would blend too much with the color of their coats but I'm pretty happy with the way they turned out. It seems one of them lost his canteen along the way but I may be able to fix that some time in the future. I'm really happy with the way they turned out. I was also kind of worried that using the same heads would look goofy but I think it worked out well. Pretty soon I think we are going to have a battle between the Wolfhounds and the Hellknights. I would bet we have close to enough Wolfhounds for a 1500 point battle as it is. With those super heavy tanks we might even have more than that. I've got to hand it to you Nathan, they look really good. 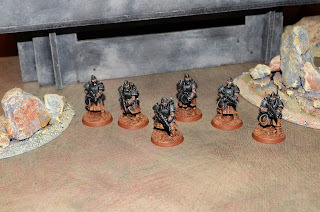 Your Wolfhound stuff has given me a different opinion of the WGF Shock Troopers. I have never liked them until I saw your work with them (though I still have never seen them in person)- which was a shame because I really liked the concept. Now I may have to pick up a box to play around with! Thank you! I would have to say that the Shocktroopers aren't the best minis out there but they are a very good value. They were an early Wargames Factory set and they are kind of shallow on detail. They do have nice character though and they seem fairly adaptable with head swaps. I think they are worth their price tag. 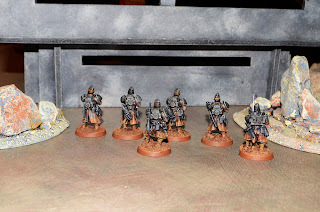 I plan to use the same models for my Jovian Empire army but I hope to used some Sci-Fi British trencher style heads instead of the German Coal Scuttle sallets that come in the main boxed set. 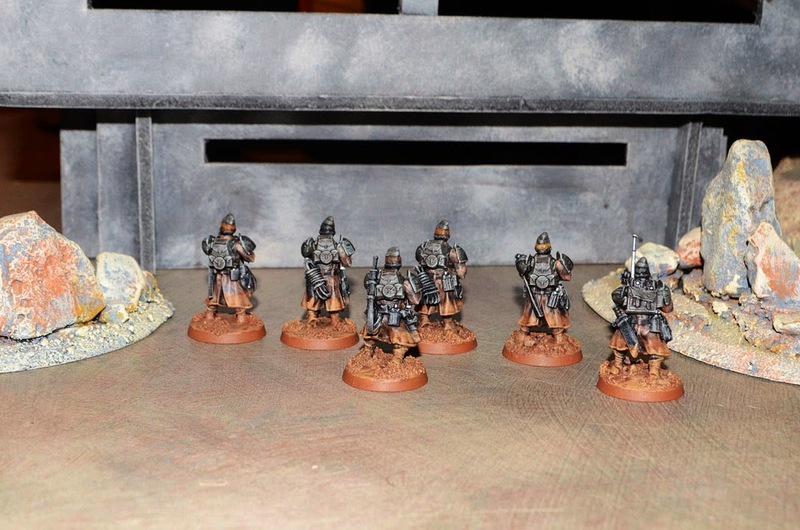 Although Jovian regiments will vary quite a bit and I may make a unit with the German style helms as well. The Wolfhound Friekorps are mercenaries but they are originally from the Empire. I'll put up their background soon. I've been a bit cautious with Wargames Factory kits after I got the British Firing Line which intended to use for a pulp setting. Needless that never took off the ground because I was really disappointed with the set. I think the way you painted the Shock Troops up works really well, and they definitely are nicer than those Colonial Brits - I recently unearthed a few packs of the Heresy Miniatures Troopers out of my minis drawer that I got during a sale a few years ago and ordered a few more a couple weeks back. They are brilliant- but the price tag is pretty steep. It's nice the Shocktroops aren't bank breakers. Will you be using the Maxmini Neobrit Trencher heads on your Jovians? I've always thought those were pretty neat. After finally settling on sci-fi skirmish rules to use I've been having difficulty finding time to paint stuff up with the holidays, my best friends wedding, etc. I did finish painting up my first 15mm miniature earlier today though, so that may be an option. It was a lot of fun and much less difficult than anticipated. Yeah I'll probably use the Maximini heads.